Whales and dolphins are not be the only sea creatures harmed by sonar technology. A new study conducted by the Technical University of Catalonia in Barcelona, Spain confirmed that sustained exposure to noise can severely damage squid and other marine invertebrates. The evidence may explain one of the mysteries of the giant squid. The elusive sea creature’s remains are often discovered with no clear cause of death. In 2003, several dead giant squid washed up on the coast of Spain. The bodies, which included a specimen measuring over 12m (39.37 ft) long, appeared a few days after the Spanish Navy conducted several sonar tests in nearby waters. Scientists investigating the giant squid remains at the time found evidence of extensive bodily damage, including mantles reduced to pulp, bruised muscles, and lesions in statocysts. Biologists speculated that the giant squid were affected by the sonar, which can range from 157 and 175 decibels and frequencies between 50 to 400 Hertz in marine activities such as oil and natural gas prospecting. “[W]e hypothesized that the giant squid died in one of two ways: either by direct impact from the sound waves or by having their statocysts practically destroyed and [the squid] becoming disoriented,” marine biologist Angel Guerra told National Geographic. Now, that hypothesis is backed by proof. Statocysts are a special type of tissue possessed by marine invertebrates. The statocysts have tiny, hairlike structures that enable the animals to balance and bend as they move through water. In the TUC study, researchers determined that two hours of intense, low-frequency sound exposure stripped the statocysts of these hairlike structures. Essentially, the noise crippled the animals. 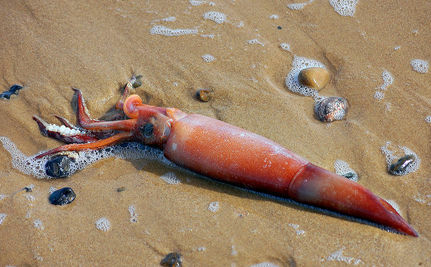 Guerra, who was not involved in the recent study, points out differences between the cephalopods in the experiment and the giant squid remains discovered in 2003. The injuries to the giant squid found last decade, he noted, were much more pronounced than in the experimental animals. Guerra attributes this to the higher acoustic intensities and multiple sound sources giant squid are exposed to in the real world. And of course, the giant squid were found not just injured but dead, unlike the test animals. But scientists say the case of the giant squid off Spain suggests death is one possible outcome of exposure to low-frequency blasts. Click here to sign a petition to stop killing marine life with sonar.